For our esteemed clients, we bring forth an exclusive range of Instant Hot Packs that are precisely designed to store the products of various types. Following, industry defined standards, offered freezer packs are manufactured by our professionals using optimum quality basic material and modern technology. Our esteemed clients appreciate these freezer packs for their varied features like non-toxic, trouble free functionality and easy to use. Packaging Details: 33 pcs. are packed in 5 ply sturdy shipper. 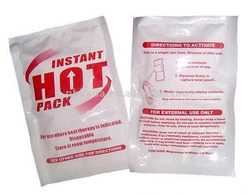 Looking for Instant Hot Packs ?